¡Chi chi chi, le le le, viva Chile! Whether you're interested in astronomy, border studies, cosmopolitan life, desert ecologies, education, extractive industries and environmental stewardship, or historic port cities, you will find something to study in the diverse landscapes of Chile and its XV regions. Our partner schools Arcadia, Butler, IES, SIT, and Washington University in St. Louis offer programs in Arica, Santiago, and Valparaíso, focusing variously on language, literature, and cultural studies; public health and traditional medicine; and politics, development, and social justice. 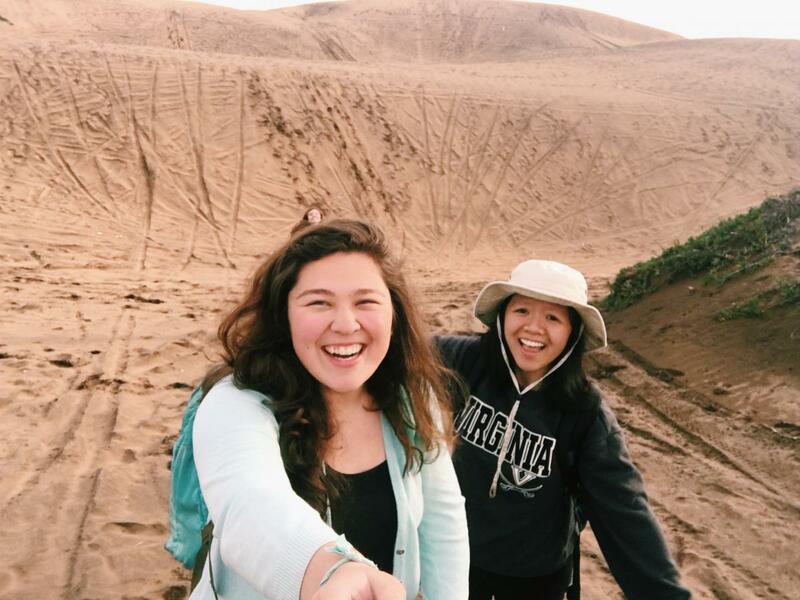 Check the Study Abroad website ("Program Search | Chile") for a full list of J-Term, summer, and semester-length options in Chile, including internship opportunities. Before you apply to a program, you must meet with your advisor for the major or minor, and speak with an advisor from the Study Abroad Office. The advisor for all programs in Chile is Martha Sadler. Why did you want to study in Chile? When I thought about studying abroad, I personally had my heart set on going to South America. I wanted a different experience, one that could bring me out of my comfort zone. The Chile program came up as an option and I was sold! A typical day consisted of eating a quick breakfast, bundling up for the cold almost-winter weather, taking the metro to the University, going on a local adventure after classes, and coming back in time for "once," essentially dinner, with my host family. 3. What classes did you take? Do we offer them at UVa? I took a Literature and Cinema course, which is similar to one that is offered here, and a course on Contemporary Latin American Identity, which was unique to the program. 4. How did it help with your coursework, research interests, or professional/academic goals? The Latin American Identity course really helped round out my overall experience. Learning the historical background of why certain things were the way they are really helped make me more aware as I walked around, went on excursions with other students, explored the local markets, and had conversations with my host family. The film course on the other hand helped confirm that studying cinema in multiple language could definitely be a career path for me. 5. What was the best thing about studying abroad in Chile? The best thing about studying abroad in Chile was interacting with the people. From talking to my host family to professors to tour guides to university students, learning more about the culture and getting insight into the language and customs was definitely my favorite part. 6. What would you want other students to know? I want other students to know that there is more than just Spain! 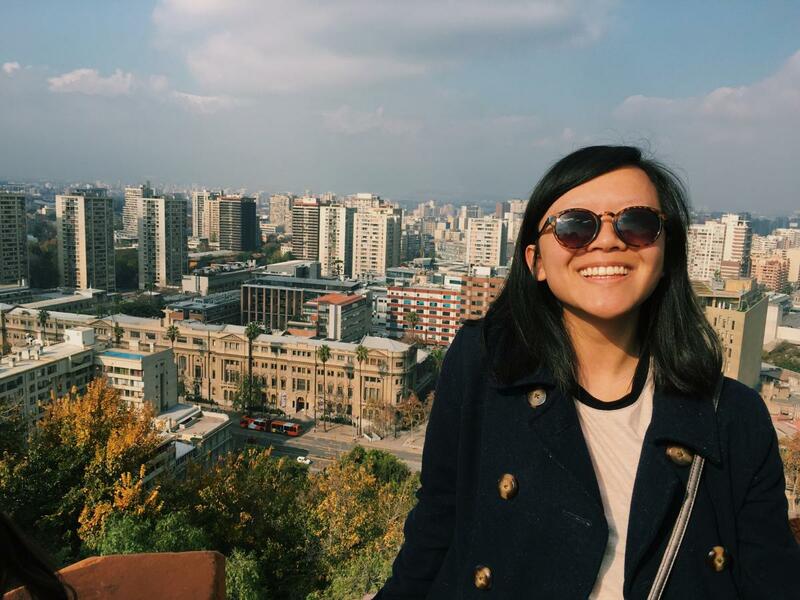 While Spain is definitely an incredible country, studying in South America, especially for a semester, unlocks a whole new set of experiences and allows for traveling between different Spanish-speaking countries and cultures. I would highly recommend going to Latin America for a study abroad program. In terms of Chile, I would say that there are a ton of dogs roaming the streets at all times and that our summer is their winter!! Bundle up! 1. Why did you want to study in Chile? All I knew is that I really wanted to study in Latin America. After looking at some study abroad programs, I found the Arcadia in Chile program. I learned about the rich Chilean culture shaped by indigenous cultures and European colonization and wanted to learn more. Furthermore, the cities of Valparaiso and Santiago have a vibrant art scene, which really drew me in. 2. What was a typical day like? In the morning I would take the metro from Viña del Mar to get to Pontificial Catholic University of Valparaíso. I would have class in the morning and then a few hours for lunch, which I would often use to explore various parts of the city, and then I would come back to class afterwards. My Arcadia group would use the weekends to travel outside of Valparaiso and Viña del Mar for adventures. Some of the things we did include exploring Santiago and visiting the various homes of the Chilean poet Pablo Neruda. I took a Latin American film and literature class and a Latin American philosophy class. UVa offers a similar cinema class, but the philosophy class is very unique and offered only at the Pontificial Catholic University of Valparaiso. I was able to transfer six credits from Pontificial Catholic University of Valparaiso to UVa. From my experience, I gained a deeper appreciation for Chilean culture. Furthermore, I developed an even stronger desire to improve my language skills in order to communicate with Spanish-speaking communities in the U.S. I had the best host family of all time. My host mom made delicious meals every day. The family and I had a very strong relationship and we had conversations over once (which is a light dinner/ evening snack) every day, which helped me improve my Spanish. My host mom and I still chat over WhatsApp every week! If you haven’t lived in a foreign country for an extended period of time, there’s a good chance you will feel uncomfortable and feel timid. However, study abroad is a chance for you to grow as a person and develop your language ability by interacting with the local people! Put yourself out there and try your best, and by doing this you will have a memorable and positive experience.